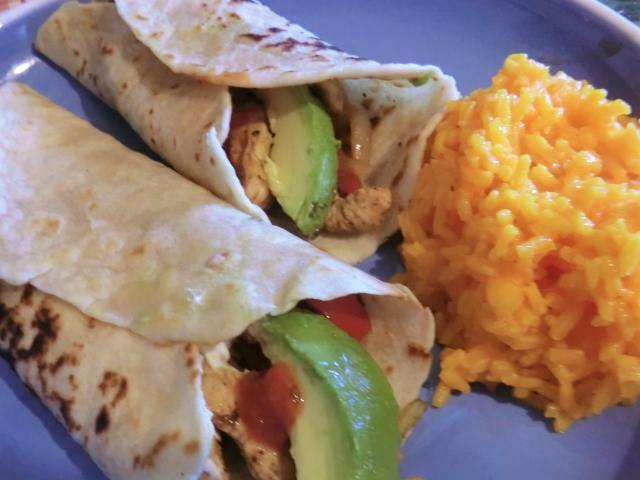 A_Boleyn | Cooking is Fun … Really!! 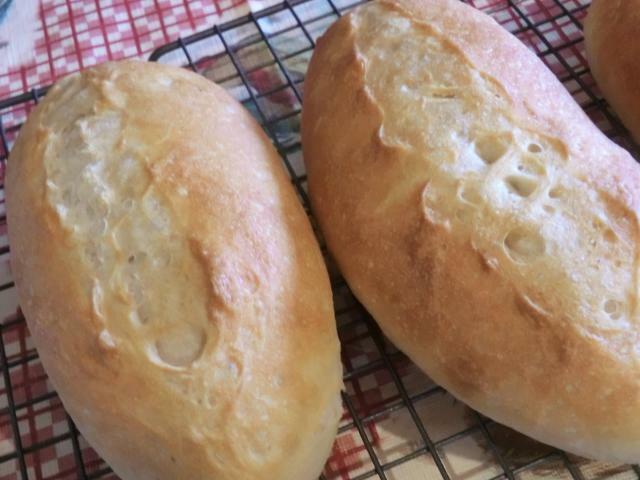 I’ve mentioned the bi-weekly bread challenges from the Bread Baking FB group before and, in this post, I’m going to share some pictures of the latest challenge, French Baguettes. 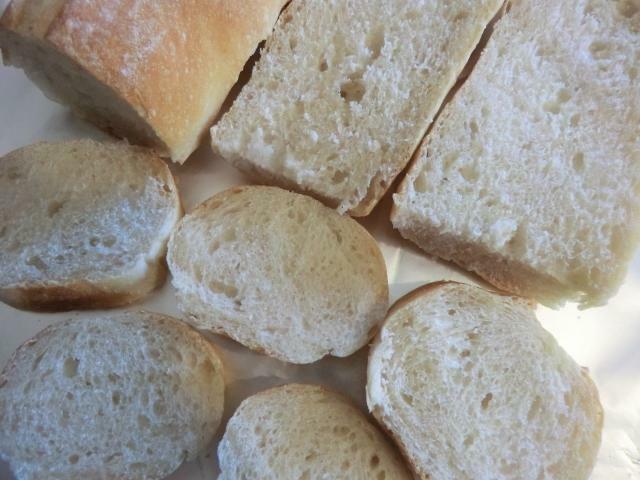 The basic recipe which was to be used for the challenge makes four baguettes. 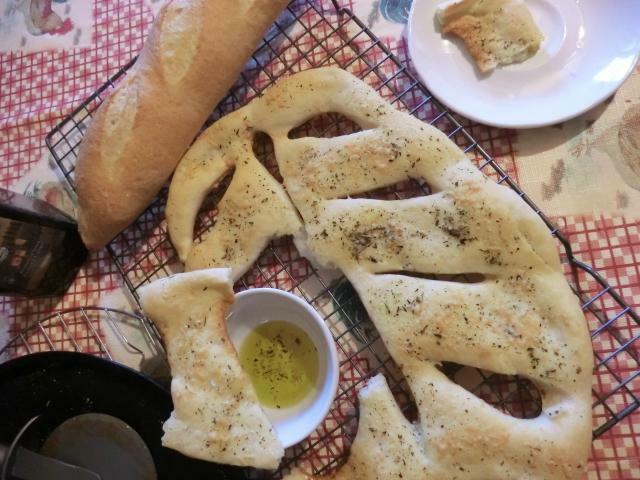 I halved it and ended up with a couple of fourteen inch long baguettes which I devoured almost immediately, so I made another half batch and shaped it into four demi-baguettes. 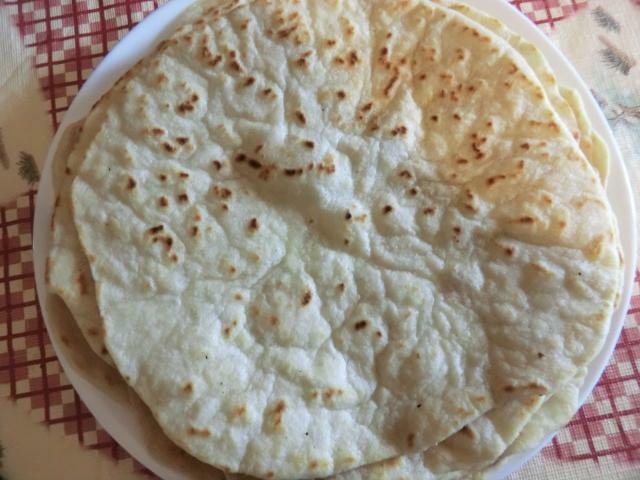 I rewrote the instructions and posted the recipe below. 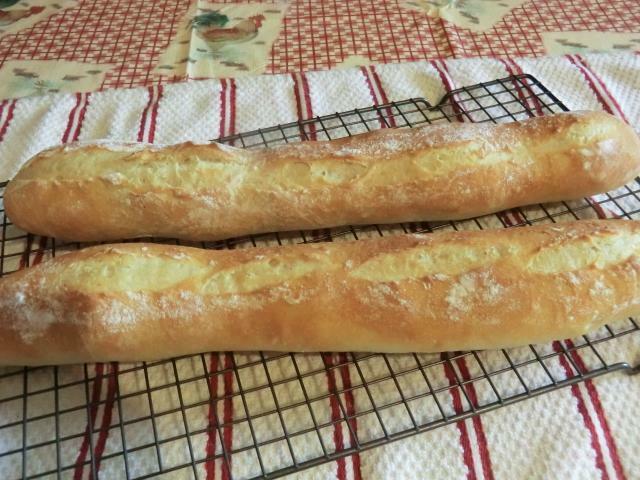 MaryAnn’s Baguettes – makes 4 baguettes, each about 14 inches/35-36 cm long. Combine poolish ingredients in a large bowl. Cover, and allow to stand until bubbly, about 45 minutes. Stir in the 2nd amount of flour. Mix until smooth. Cover and let stand for 10 minutes. Sprinkle on the Kosher salt and, with oiled hands, slide fingers under each side, and stretch and fold over the top a few times, turning the bowl with each fold. Let stand for 15 minutes and stretch and fold a few times. Repeat the folding routine several times over the course of an hour. Allow to double. 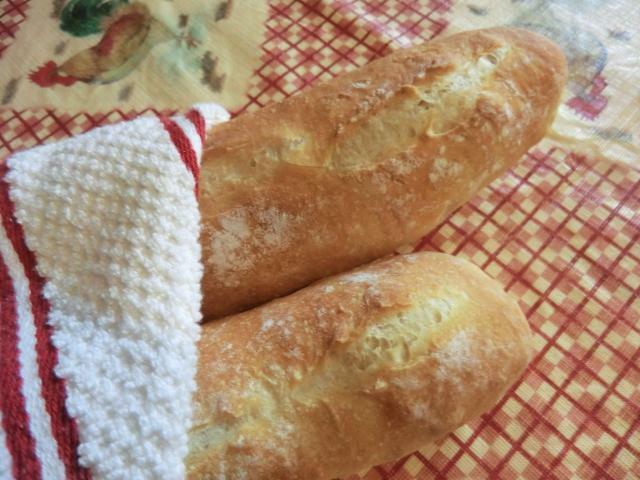 Preheat oven to 450 deg F/232 deg C.
Slash the baguettes and bake for 20-25 minutes. 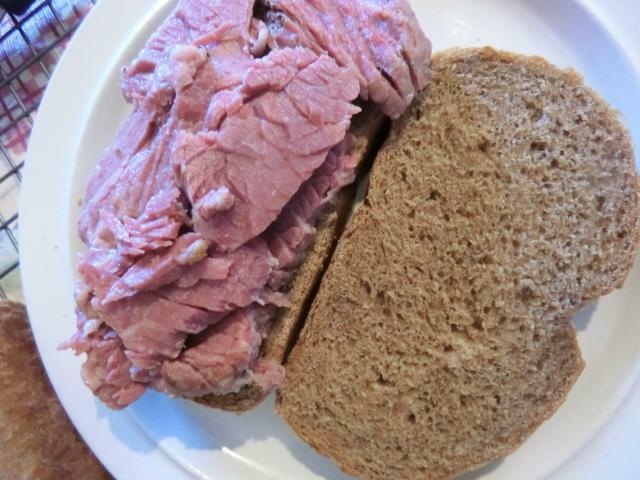 A future bread challenge is for a rye bread. 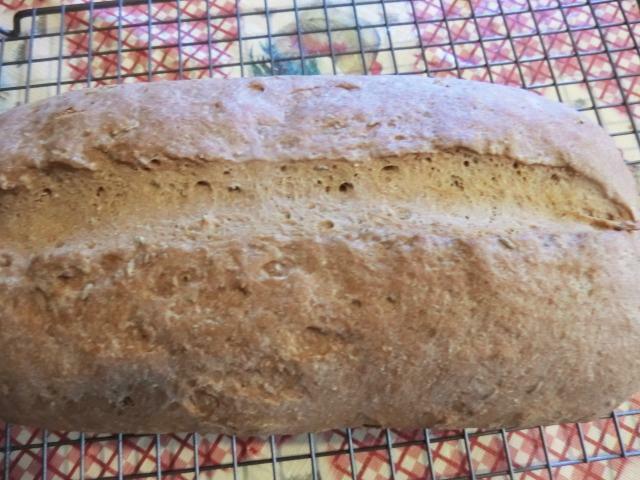 I’ve never baked with rye before so I picked up some flour from the Bulk Barn and decided to try a small rye loaf recipe shared on the group. I added some cocoa powder, molasses and salt to the dough and rewrote the instructions. The recipe is posted below. Proof the yeast with molasses and warm water for 10-15 minutes until foamy. 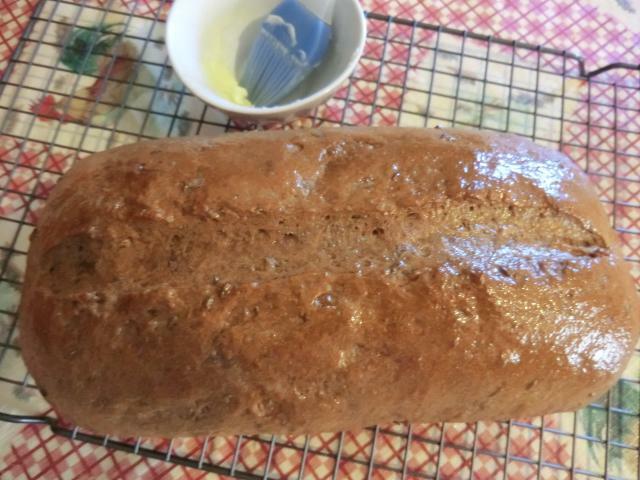 In a large bowl, combine the rye flour, caraway seed and all but about 50 gms of the bread flour. Add the salt, cocoa powder and brown sugar, if using. Stir together to mix all dry ingredients. 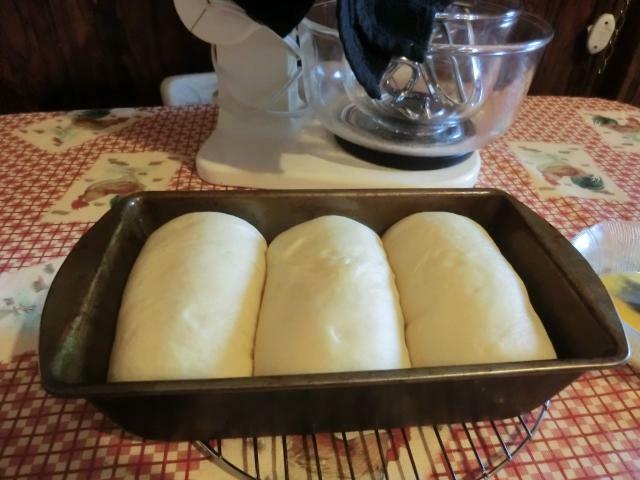 Make a well in the middle of the flour mixture and add the proofed yeast, oil and vinegar. Stir well until a ball of dough forms. 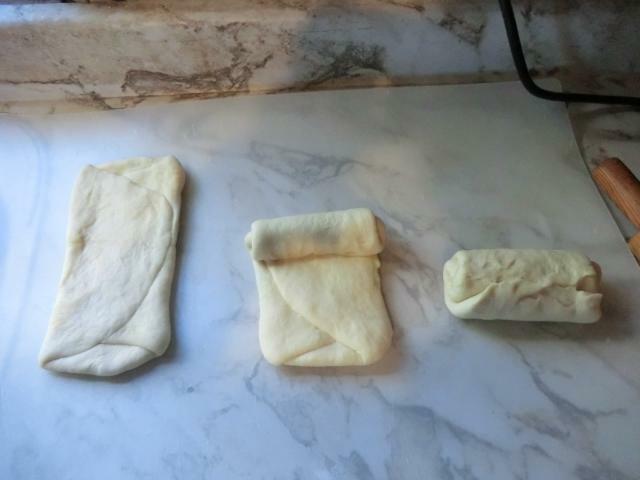 Transfer the dough to a working surface lightly sprinkled with some of the reserved flour. Knead for 10 minutes using up the remaining flour. Cover the dough with the bowl you mixed your dough in. Let rest for 10 minutes then knead for a further 10 minutes and shape into a ball. Lightly rub a clean bowl with some vegetable oil. Add the ball of dough to the oiled bowl. 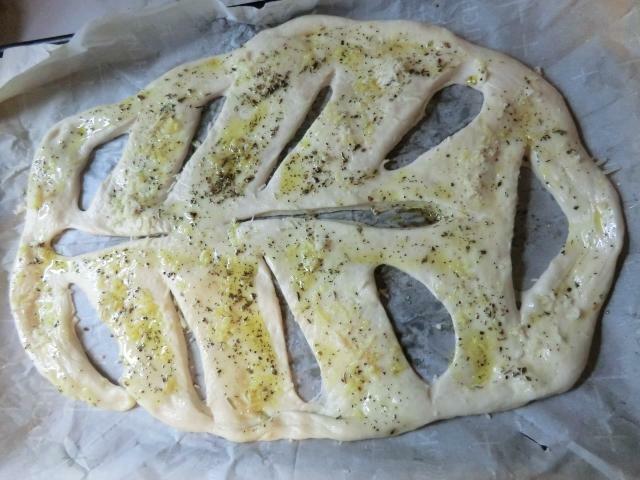 Turn the dough a few times to lightly coat with the oil. 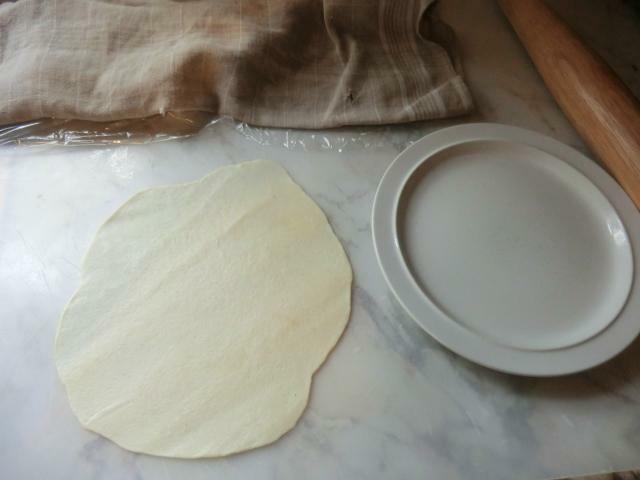 Cover the bowl with a sheet of plastic food wrap and drape with a towel. Let rise in a warm area until doubled, 1 – 1 1/2 hrs. 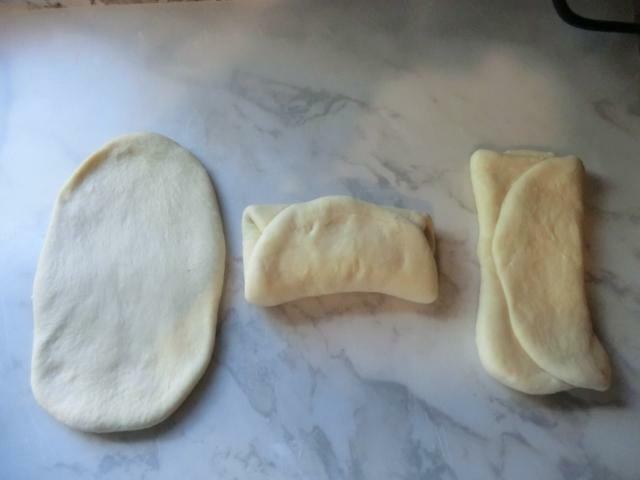 Preheat the oven to 190 deg C/375 deg F.
Lightly punch down the risen dough, shape to fit into a loaf pan and let proof until at least 1 1/2 times larger. (It may not double though mine did in about 40 minutes.) Spray the loaf with water and slash the top, if desired. 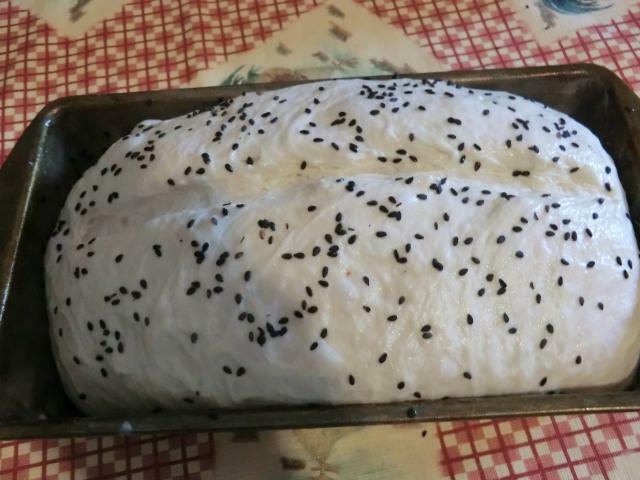 Bake the bread for 40 minutes or until knocking on the bottom of the loaf gives a hollow sound. 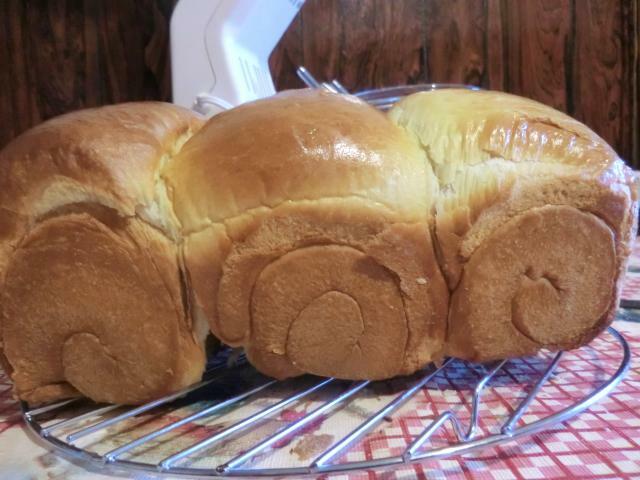 Brush the top of the loaf with softened or melted butter to give it a glossy appearance. Let cool overnight before cutting. For some reason, I never shared the results of a recent experiment in turning a relatively tough eye of round roast into a more tender piece of beef. 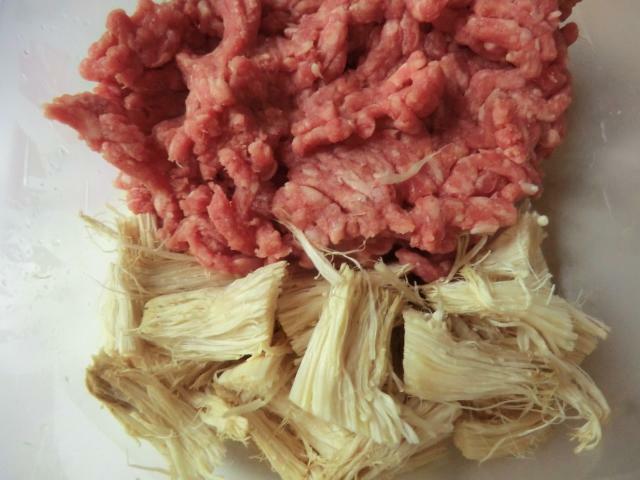 The technique of ‘velveting’ is practiced in Chinese restaurants and is used for both beef and chicken dishes. I velveted in water, not oil, because I wasn’t comfortable with the idea of the latter, nor did I want to waste the oil. I’m frugal that way. 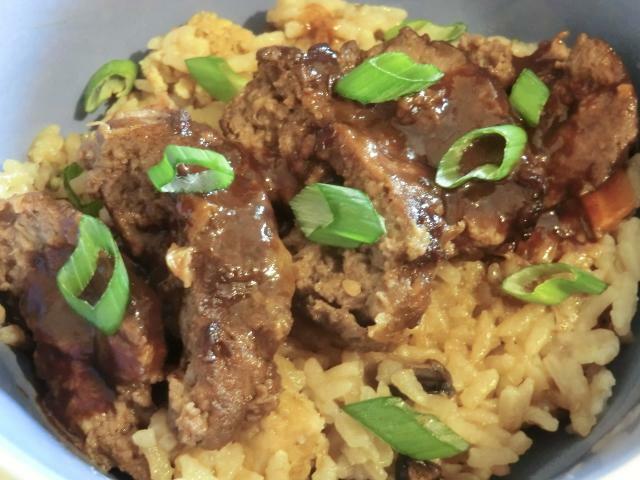 For the spicy beef dish below, I used the recipe/technique found on the YouTube video here. The ingredient list and amounts I used are listed in the bare bones recipe below. Wash meat and drain well. In a bowl, combine egg white, Chinese wine, oil, cornstarch and salt. Whisk together until smooth and frothy. Add meat and marinate in the refrigerator for about 30 minutes. In a colander, drain meat. In a pot over high heat, combine about 2-inch deep of water and 1 tablespoon of oil. Bring to a boil. Reduce heat to medium low and immediately add meat, stirring to disperse. Bring water back to a gentle simmer and once it’s barely bubbling, continue to cook meat for about 1 minute, stirring occasionally. With a slotted spoon, remove meat from pot and drain well. 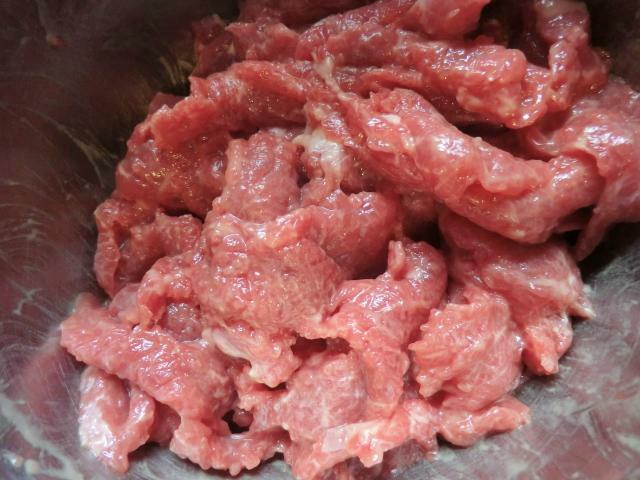 NOTE: You’ll want to velvet the meat in two or three batches making sure that you add the meat slices a few at a time, rather than in clumps, so they don’t stick but float freely in the pot of water. 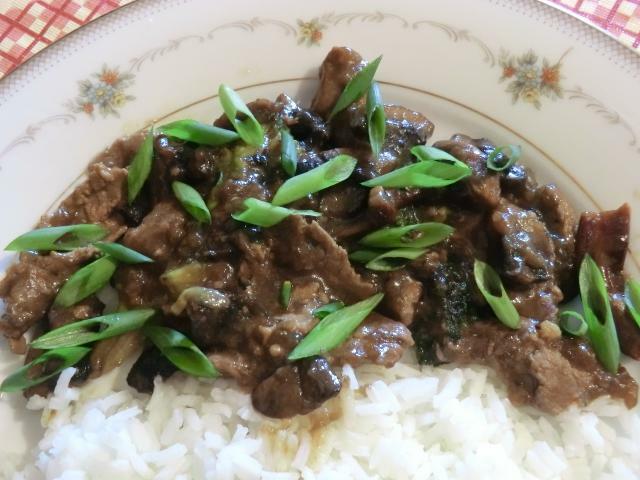 Review of the Velveting Technique: While delicious and noticeably more tender than previous attempts at the dish using the same cut of beef, WITHOUT velveting, the beef wasn’t quite as meltingly tender as the beef I’ve eaten in Chinese restaurants. I think the technique and dish will continue to be a work in progress. 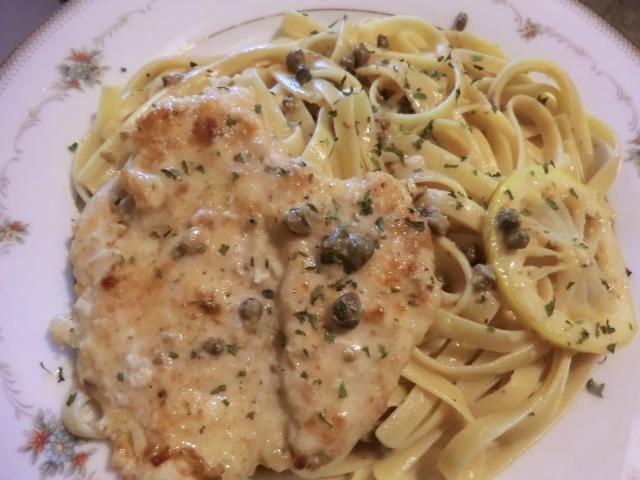 Meal planning strategy: I haven’t cooked anything Italian in some time, there was a jar of capers languishing in the fridge and a couple of boneless, skinless, chicken breasts in the freezer, so I looked for a recipe for Chicken Piccata that used ingredients that I already had. 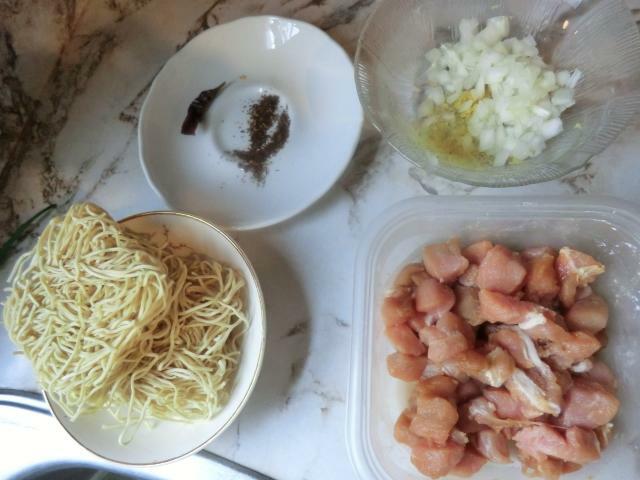 The breasts weighed a bit over a pound so I split them horizontally into four, more or less equal sized portions, and made some adjustments to the recipe I found here since I wanted to toss the pasta in the sauce. Cook the pasta according to package directions. Drain, stop the cooking by transferring the noodle to cold water and then, if needed to wait for the sauce, transfer the noodles to warm water. 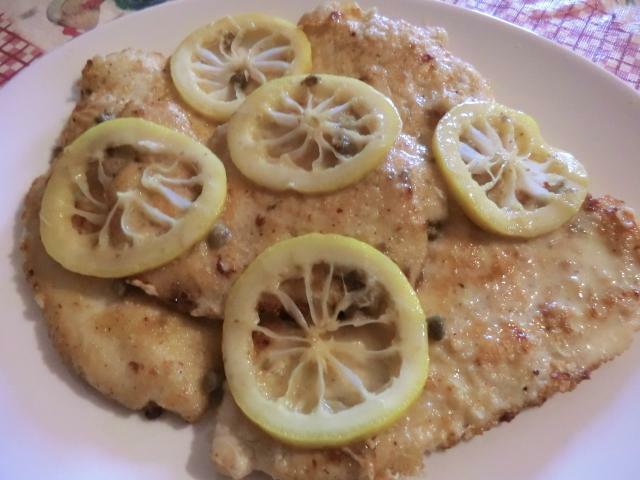 To make chicken cutlets, cut each chicken breast horizontally into two equal sized pieces or butterfly and cut in half. If the thickness of the cutlets is uneven, put them between two pieces of plastic wrap and pound them with a meat hammer to 1/4 inch thickness. 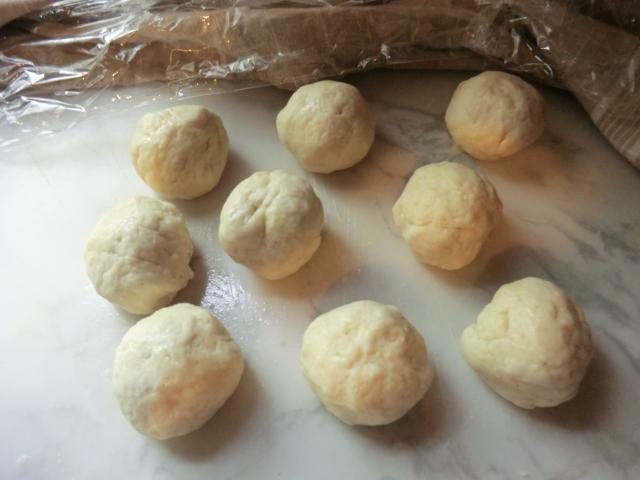 In a shallow pan or pie tin, mix together the flour, salt, pepper, and grated Parmesan. Rinse the chicken pieces quickly in water, drain well and dredge them in the flour mixture, until well coated. Heat the olive oil and 1 tablespoon of the butter in a large skillet over medium/medium-high heat and when heated, add the chicken cutlets. Do not crowd the pan to ensure even cooking. Cook in half batches. Brown well on each side, about 3 minutes per side. 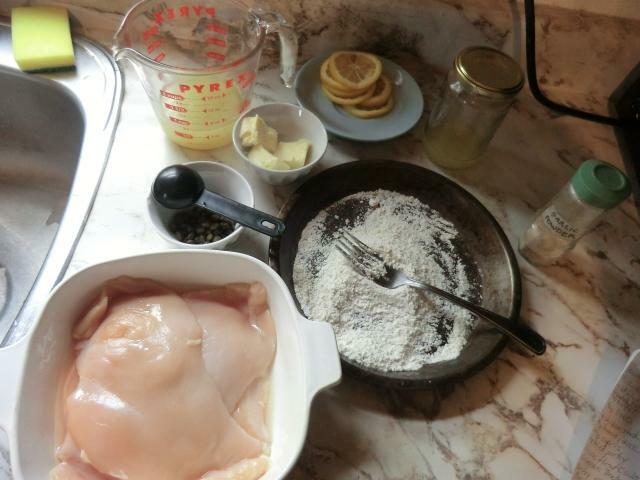 Remove the chicken from the pan and transfer to a plate with a rim to retain any juices that may be released by the breasts. Cook the other breasts in the same manner. Cover to keep warm. Whisk in the remaining 1 tablespoon of butter (cut into 2-3 pieces), a piece at a time until each piece just melts. This may not be necessary if you’re using the whipping cream as that will thicken the sauce. Drain the pasta well. Add the pasta to the saute pan so it can warm in the sauce, if it’s cooled down. Divide the pasta between two plates. Plate the chicken over the pasta and serve with the sauce poured over the top. Sprinkle with parsley before serving and add a slice or two of the lemon for garnish. I set aside two of the cutlets for use in other dishes as there was too much chicken for two servings. I’ve got a backlog of pictures that I wanted to share but couldn’t come up with a good way to tie these disparate items together, so I’m just going to lump them into one post, and let you sort them out. Since I gave up buying bread at the grocery store, I have to restock whenever I run out of bread in my freezer. And, of course, pizzas are on the roster of regular meals at home or for work lunches. Instead of making my usual two pizzas, I used half of the dough to make a foguasse, a sort of pull apart French bread. The shaping (leaf-like) is designed for easy tearing and sharing. Or you can just eat it all yourself dipped into a small bowl of herb, sea salt and freshly ground pepper infused extra virgin olive oil. I rolled it out a bit too thinly so by the time I slashed and opened up the dough, it got too thin in some areas. They got crispy rather than remaining puffy and being a sponge for the oil. But I dealt with the hardship. 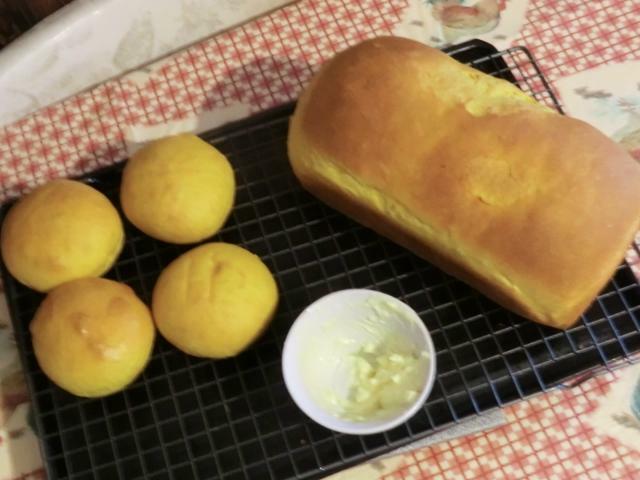 I turned a small sweet potato, into a loaf of regular sandwich bread (700 gm of dough) and four small (60 gm, pre-bake weight) buns. 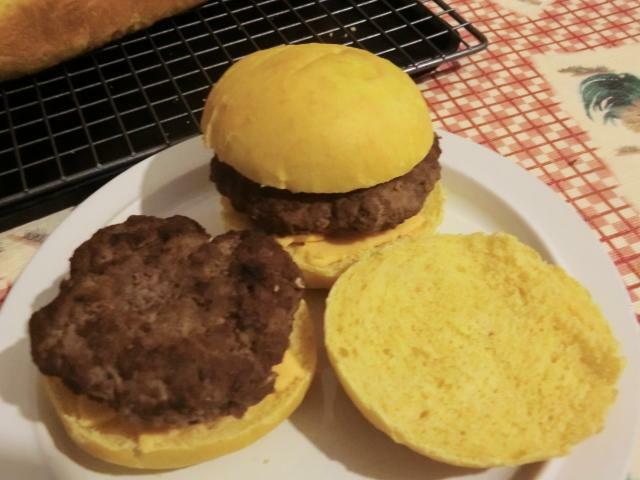 Two of the buns were used for mini hamburger patties. 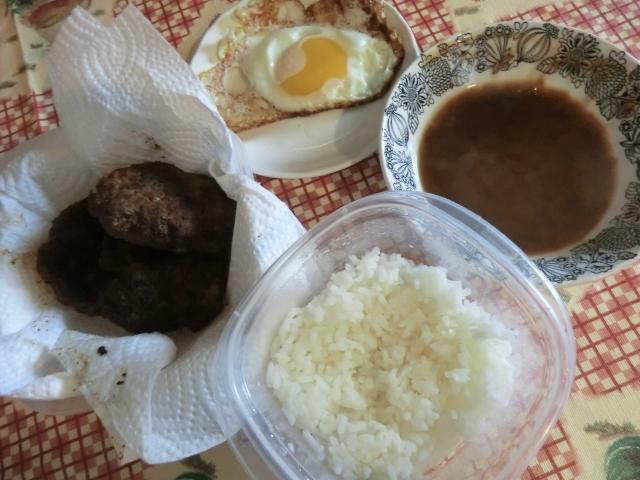 The hamburger patties for the buns were leftover from making loco moco. 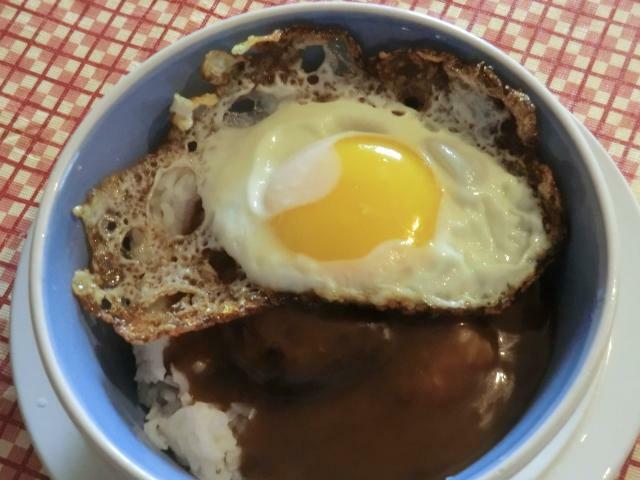 Loco moco is a Hawaiian dish consisting of a bed of hot steamed rice (long or short grain works) topped with a hamburger patty and beef/brown gravy. It is often topped with a fried egg, runny yolk preferred, and served with a side of pasta salad. 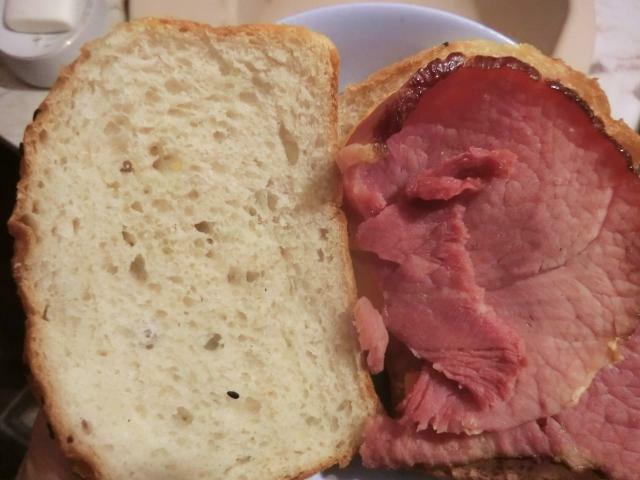 Two slices of fried Spam may be served along side. 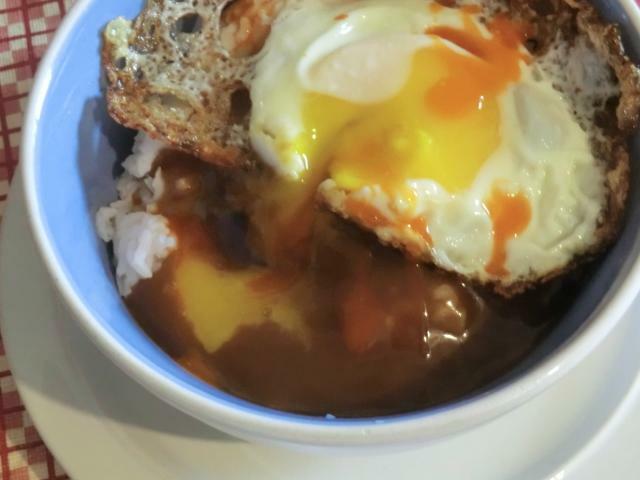 I’ve made the classic burger loco moco and one featuring Spam served with eel sauce instead of the beef gravy in the past and it’s a delicious and easy meal to put together. 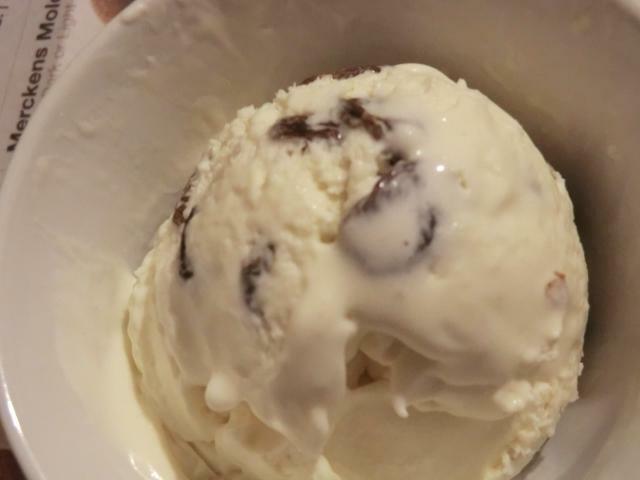 I wanted something sweet and had a bit of nostalgia for my mom’s favourite ice cream flavour. This was a boozier version than she ever tasted. Soak raisins in rum for one hour or overnight. 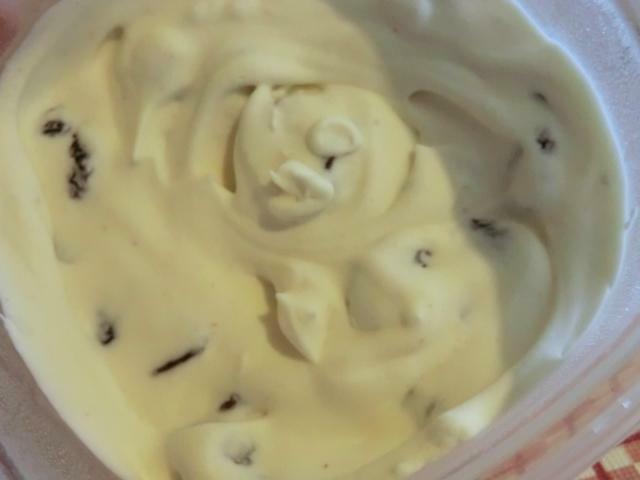 Drain off the excess rum and add the raisins to the condensed milk and vanilla in a large bowl. Whip the heavy cream in second large bowl. 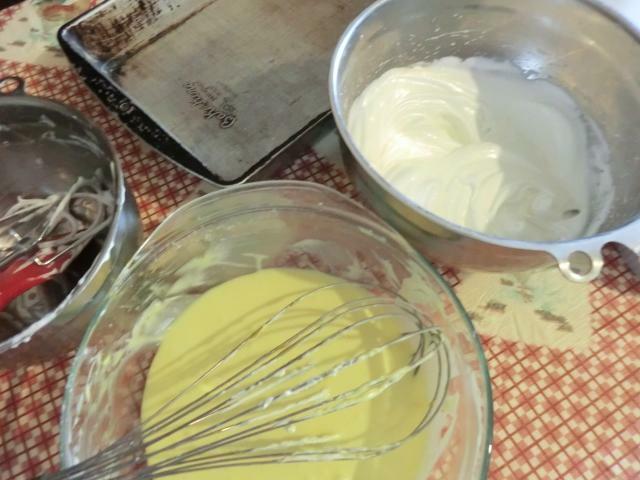 Fold the whipped cream into the condensed milk/raisin mixture. Pour into freezer container and freeze for at least 6 hrs or overnight. A while ago, I went shopping and came home with a nice clamshell of strawberries. They were on my list. They were even on sale. Trouble, was, I had forgotten why I bought them. (I must learn to write these things down … somewhere.) So there I was, staring at these very perishable fresh fruit while the clock was counting down. I finally came up with few ideas. I had a lone banana in the freezer so I made this Banana-Strawberry Smoothie. I’m sure I wrote down the recipe somewhere and when I find it, I’ll be sure to add it. 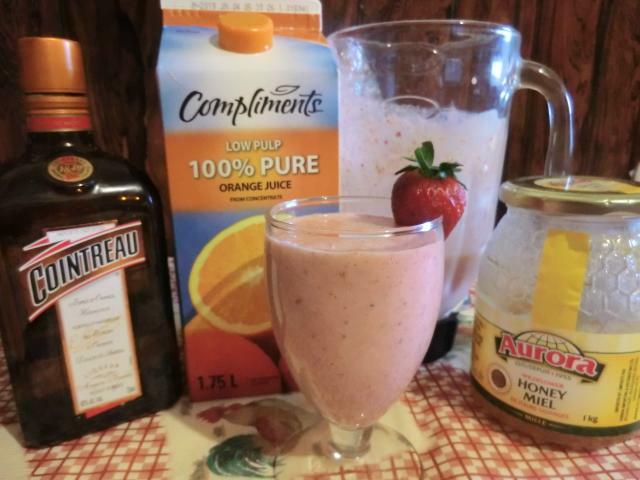 I know that I used a half a cup each of milk and orange juice, about a cup of washed and hulled strawberries, 2-3 tbsp plain Balkan yogurt and a tbsp of honey for sweetness. And, of course, one frozen banana broken into chunks so as not to strain my blender. An ounce of Cointreau may have found its way in there. Just sayin’. 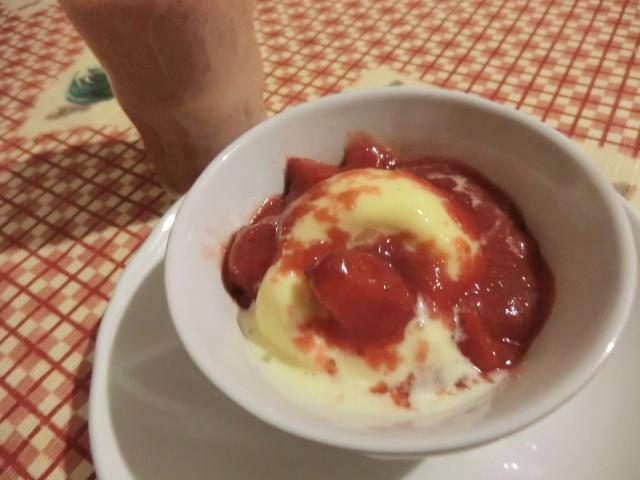 After a bit of searching on line, I found a recipe for a barely cooked, strawberry sauce. 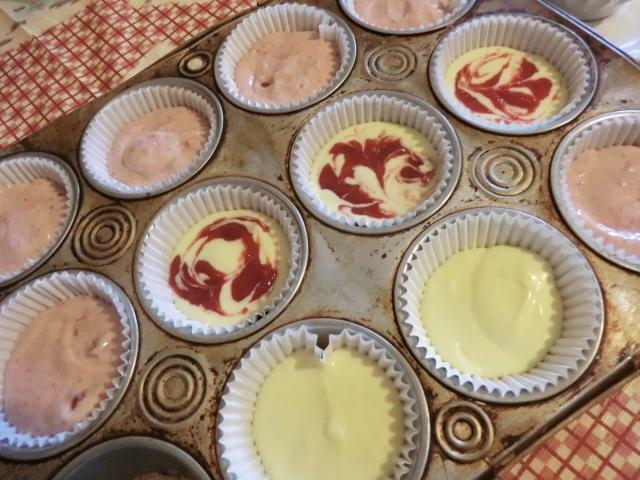 and stirred some into a batch of mini Strawberry Cheesecakes. Less is more, as in many things, and I actually liked the marbled version of these minis better. Just a touch of concentrated flavour, and the visual was more striking. Place strawberries and corn starch in a blender. Cover and puree until smooth. Pour strawberry sauce into a saucepan and bring to a boil over high heat. Cook and stir until the sauce is thick and shiny, about 2 minutes. Set aside 1/3 cup and cool. Cover and refrigerate the remaining sauce for serving. 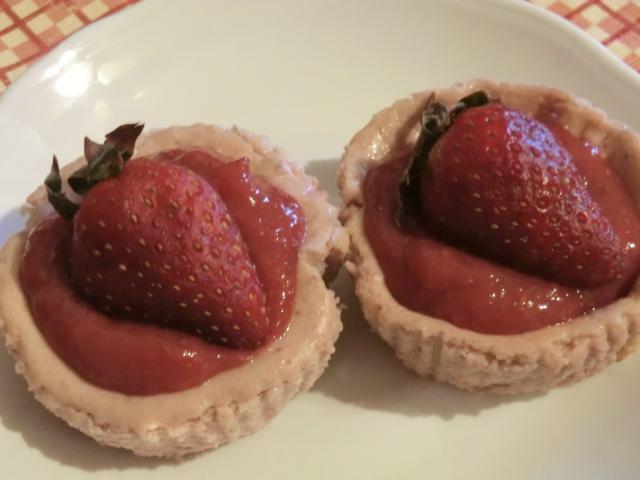 For a fresh touch, I chopped up some fresh strawberries into small pieces and stirred them into the still warm sauce. I DID eat some plain. Oh, and I finally remembered why I bought the strawberries. I was going to make a vanilla sponge/Swiss roll and add diced strawberries and whipped cream as a filling. One day, it WILL happen. I’ve been curious about this cheesecake for some time and finally got around to giving it a try. Since some recipes called for as many as 8 yolks and 12 whites, which I didn’t want to commit to the recipe, I looked for one which seemed more restrained in its egg use, and didn’t give complicated baking instructions involving adjusting the temperature during baking. As a final complication, I didn’t want to make a full sized recipe. I don’t have the 7 or 8 inch diameter springform pan (mine is a 9 inch) called for, in the first place, and, secondly, a full sized cake is too much for a single person. Based on the recipe, I used, I guesstimated that a full recipe, would make about 4-6 cups of batter. 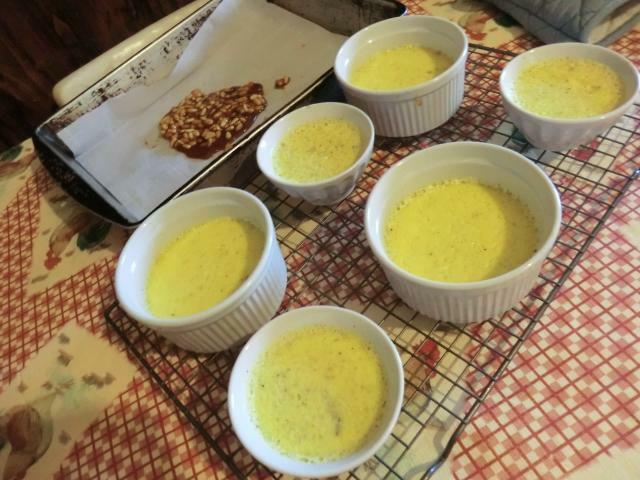 So, I thought that the batter from a half recipe would distribute nicely among three or four one-cup ramekins with room for souffleing. 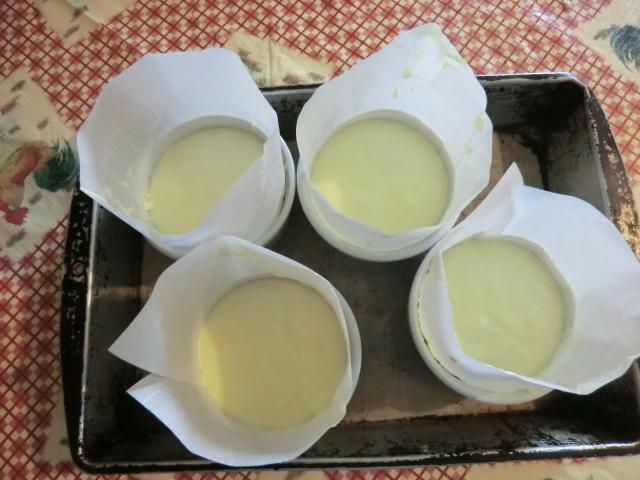 I prepared four, to be safe, and added four inch tall parchment paper collars to accommodate the expected souffleing. (The collars didn’t turn out to be needed.) I filled each ramekin about three-quarters full and baked the ramekins in a water bath for 40 minutes, at 320 degrees Fahrenheit. 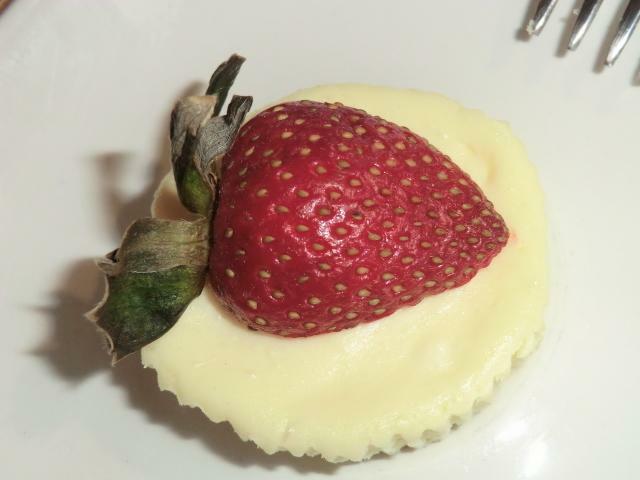 A wooden toothpick inserted into the middle of a cheesecake came out clean, at this point. 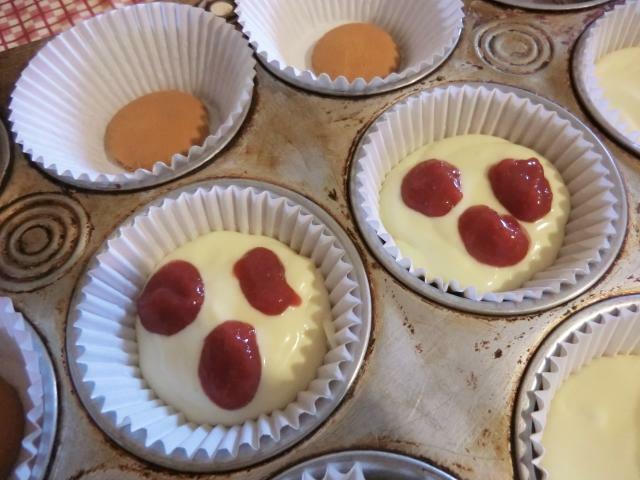 Even though the top was as pale as when I put the cheesecakes in the oven, I decided not to bake any further and shut off the oven, leaving the cheesecakes in the oven for another 30 minutes to cool and set fully. 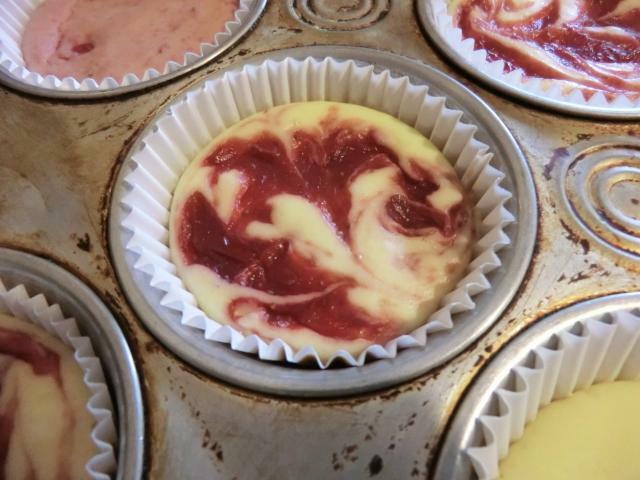 ETA (03/30/19): Refrigerate the cheesecake for at least 4 hours before eating. 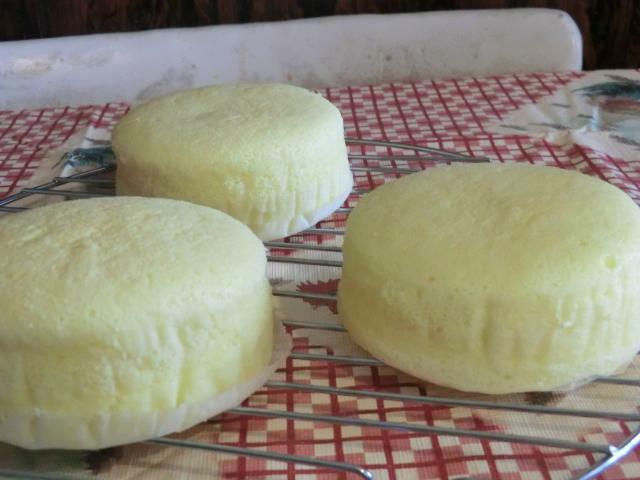 The cold temperature sets the cream cheese and improves the flavor and texture. Store any remaining cake in the refrigerator for up to 1 week. To freeze, wrap the cake tightly with plastic food wrap and then a layer of foil. Freeze for up to 3 months. For aesthetics, I brushed some apricot glaze, made from stirring together 1 tbsp of apricot jam with 1 tbsp of warm water until smooth, over the top of the cheesecake. I ate the first one warm because … well, I couldn’t wait until the next day to eat it cold. 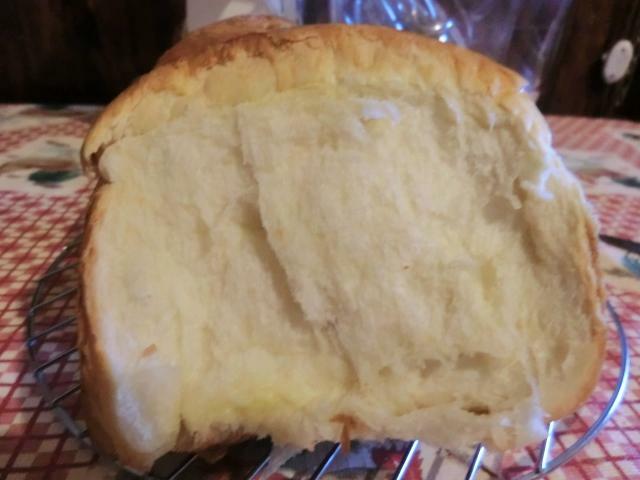 Review: The recipe isn’t very challenging technique-wise, especially if you’ve ever made meringues or any cake involving folding flour etc into a fluffy egg white base to minimize deflating. 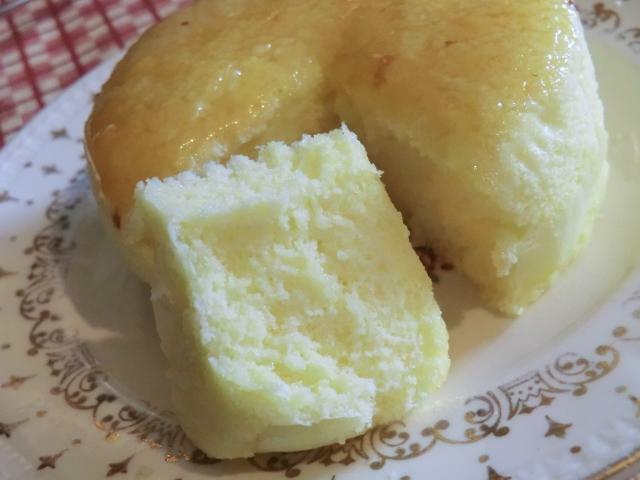 It was very tasty warm, with just a bit of added sweetness from the glaze to contrast with the slight tang from the lemon juice and cream cheese. 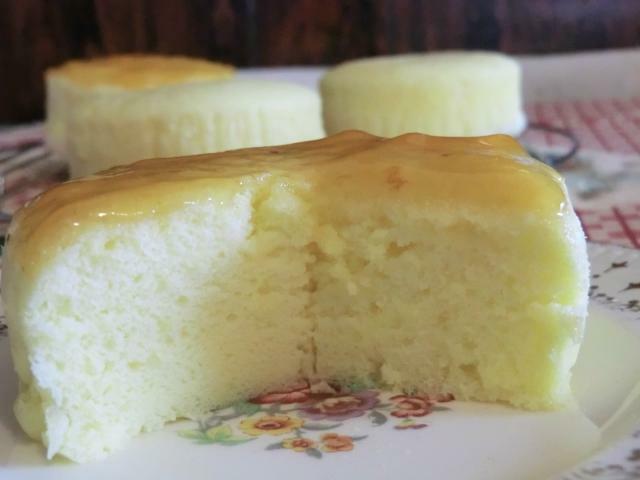 I liked the texture which was more similar to a moist pound cake than to a classic cheesecake. 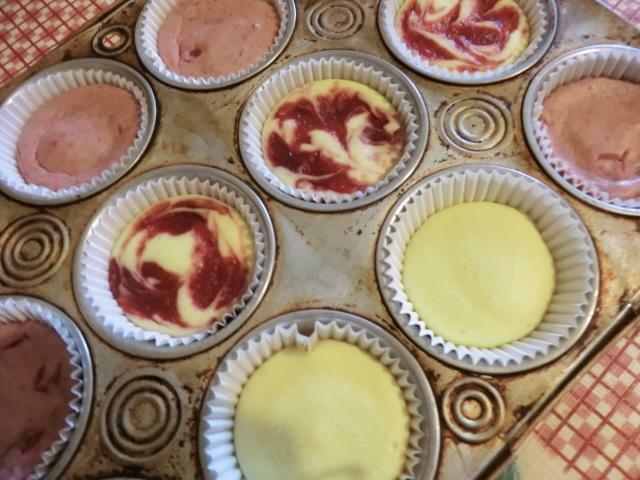 NOTE: Refrigerating the cheesecake overnight transformed the cheesecake. It became more CHEESECAKEY and less ‘cakey’. 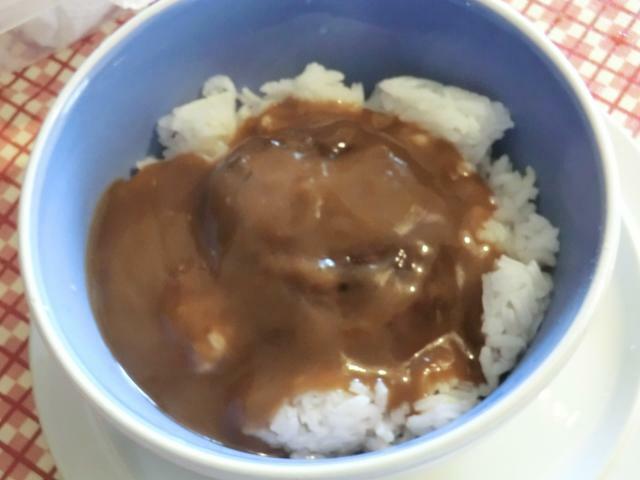 The last post on the theme of easy Japanese dishes features a Japanese version of the classic Western hamburger, hambagu, or hamburger steak patty. I’m including a couple of miso soups, a vegetable side dish and some pudding (or purin, in Japanese) to finish things off. The recipe for the hamburger comes from TabiEats and the result was meant to be used in a bento box. Instead, I used it as a topping for leftover Japanese mixed rice. Mix all the hamburger patty ingredients together well. Shape into patty to get out the air. Divide into 2 and reshape into hamburger steak patty. Make a small depression in the center as the middle puffs up during frying. Pan fry over medium heat in 1 tsp vegetable oil for a few minutes on the first side and then turn and finish. 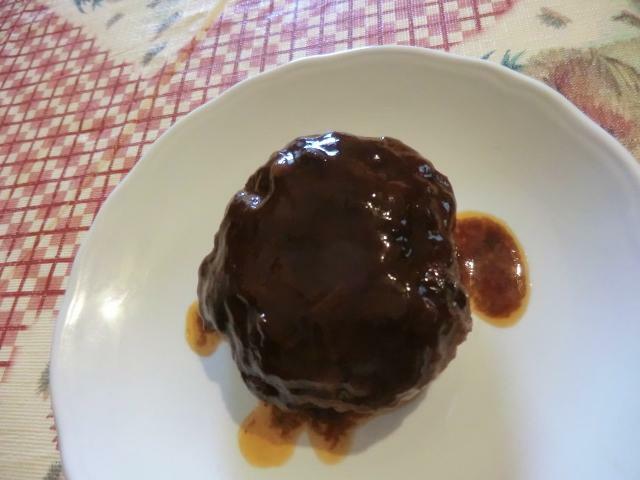 Since the burger on its own seemed a bit dry, I borrowed a recipe for a wine reduction hamburger steak sauce from Nami’s Just One Cookbook. 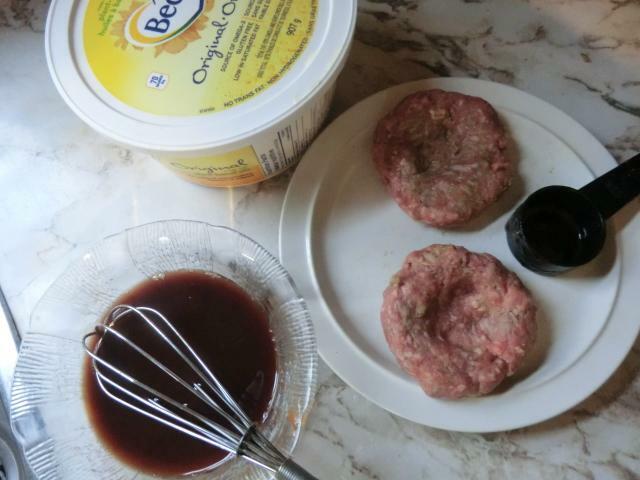 Halve the ingredient amounts for the sauce, from the recipe below, if you’re only making two patties. 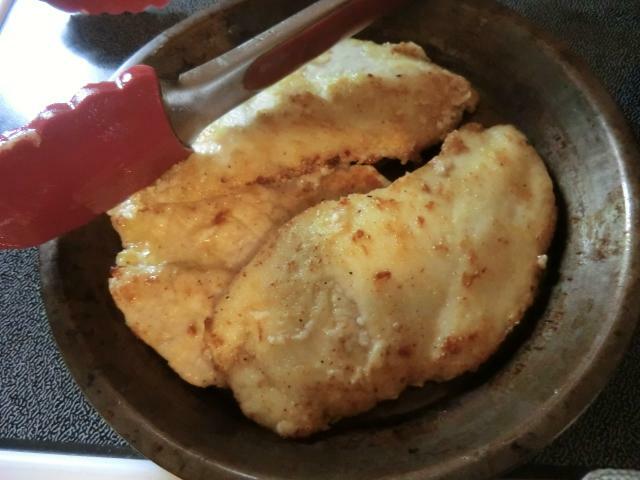 Heat a cast iron or non-stick frying pan over medium heat. Add the hamburger patties and fry 3-4 minutes on the first side. Flip, and add a couple of teaspoons of red wine into the pan. After you flip, pour 2-3 tsp red wine into the saucepan and then lower the heat to medium-low. Cover the pan and cook for 5 minute, or until the inside of the patty is no longer pink. Take the lid off and increase the heat to medium-high to let the red wine cook off. 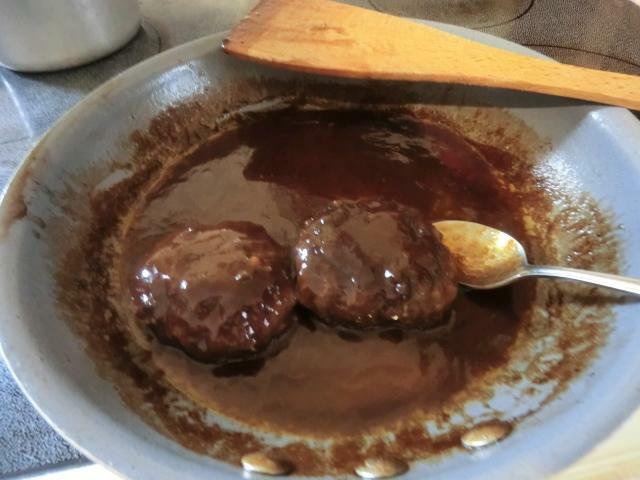 When the pan is almost dry, remove the patties to a serving plate and reserve. Combine the liquid sauce ingredients in a bowl. 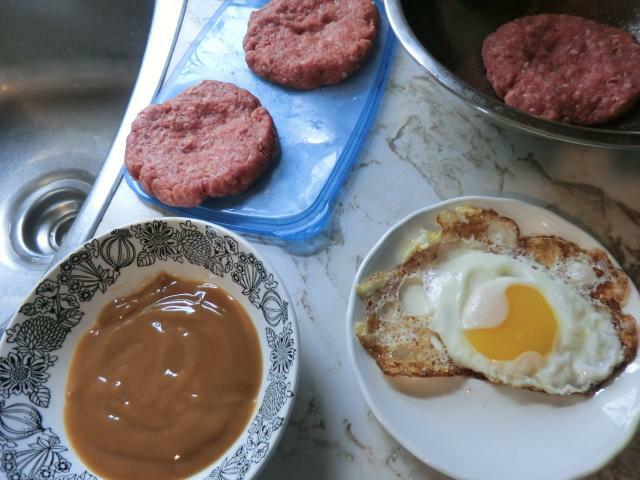 In the same pan in which you fried the hamburger patties, add the butter the and sauce ingredients and mix well. Lower the heat to medium low and let the sauce simmer for a few minutes to cook off the alcohol. With a slotted spoon, remove any meat bits or scum from the sauce so it’s nice and smooth. When the sauce has thickened to your liking, pour it over the hamburger steaks. 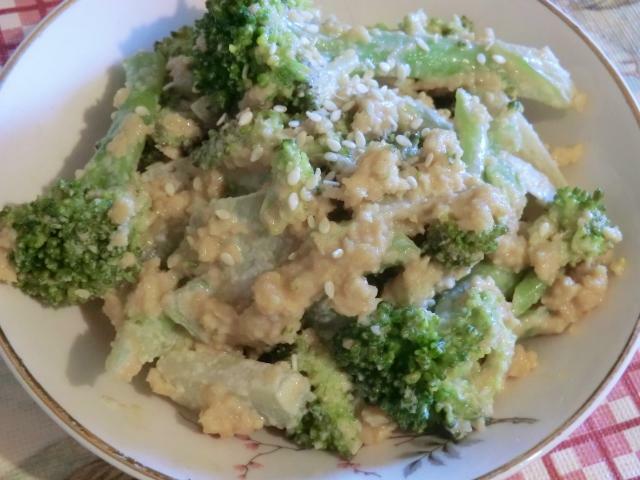 Serve with vegetable sides and rice. Shira-ae is a tofu ‘dressing’ made of ground sesame seeds/tahini, miso and tofu and added to shredded vegetables. 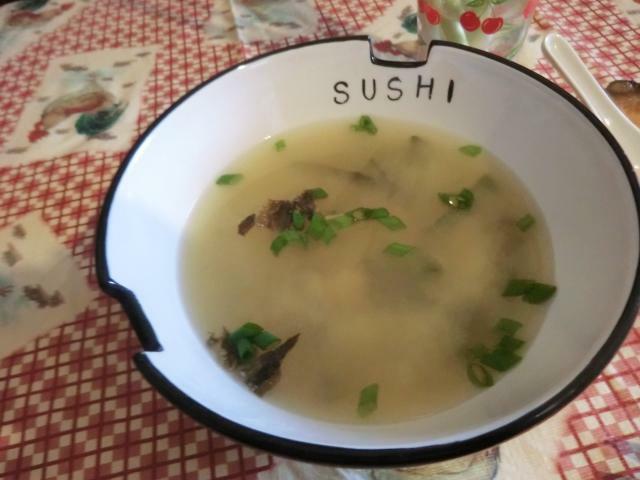 I used it to dress some blanched broccoli florettes and served it with one of the hamburger patties and a bowl of miso soup. 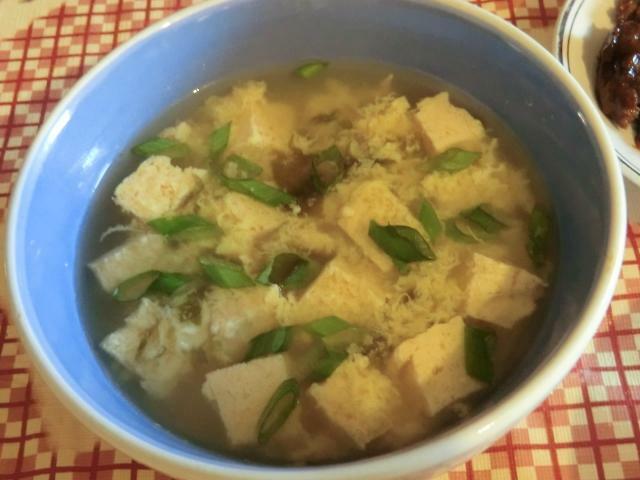 Two kinds of white miso soup … egg drop/egg flower and tofu or a clear soup. 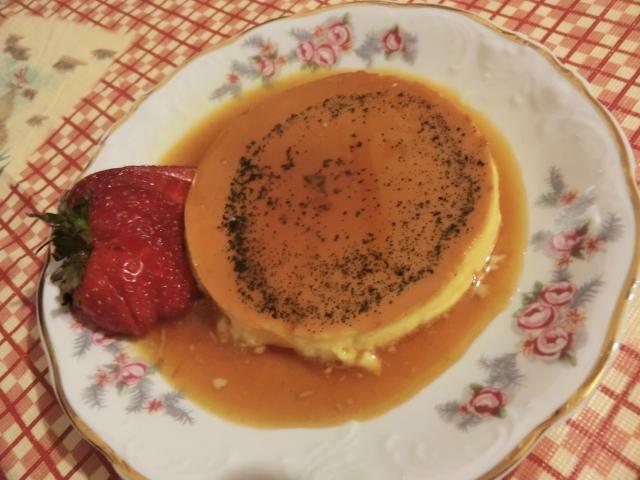 Dessert was pudding, or purin, in Japanese. Both these desserts were made with the same vanilla bean custard mixture. 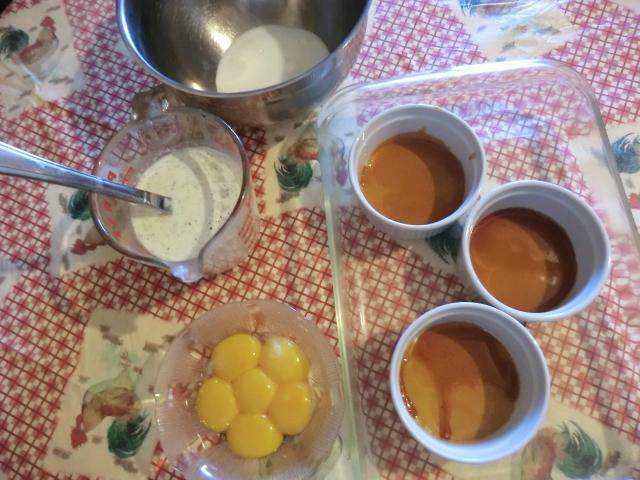 For the flan/creme caramel, I made a hard caramel and poured it into the bottom of the large ramekins. 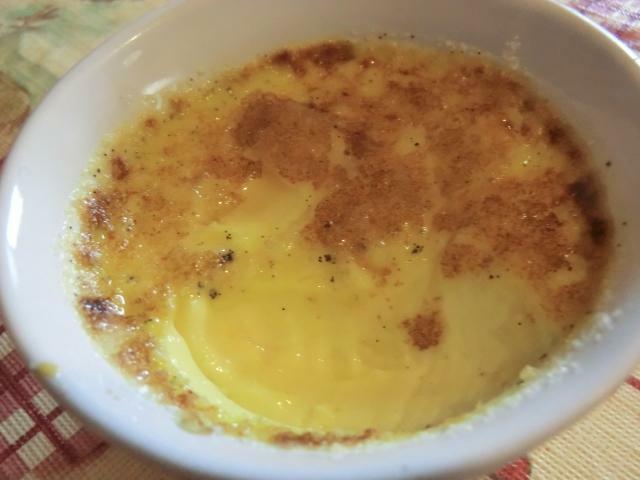 The smaller ramekins were turned into creme brulee and bruleed under the broiler. I stayed up late last night reading the last J.D. Robb mystery I brought home from the library. Eve Dallas and Roarke are a pretty hot couple. Determination, brains and a kick-a&& attitude. I had intended to run some errands today. Maybe pick up some carrots, onions and garlic from the grocery store, cause I’m out. Or go out to Bulk Barn and Canadian Tire and pick up some baking ingredients and a replacement spice and coffee grinder … then I didn’t. Right now I’m watching TabiEats videos … the Food Hauls or tours of various areas of Japan or cooking traditional Japanese foods etc, always something interesting … while doing a load of laundry. Supper is going to be pizza (and possibly a focaccia) and a bowl of turkey noodle soup with some home made turkey stock and the last of the picked turkey meat from the freezer. I keep putting off posting the last of the Easy Japanese themed installments I was planning. 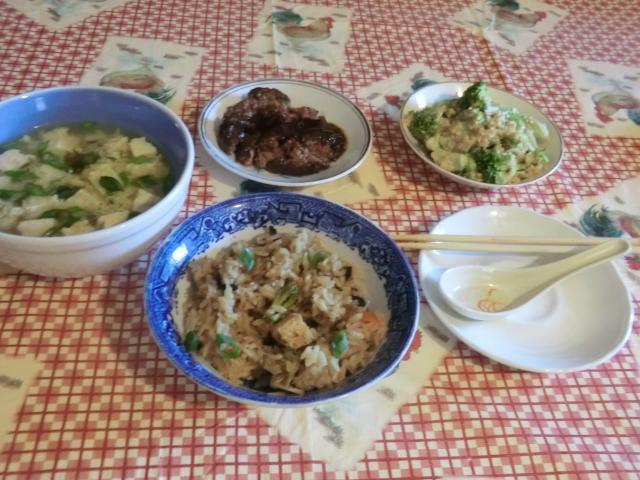 Because there are a couple of other dishes I want to throw on the post. I guess I really SHOULD just post what I’ve got and clear out my camera. 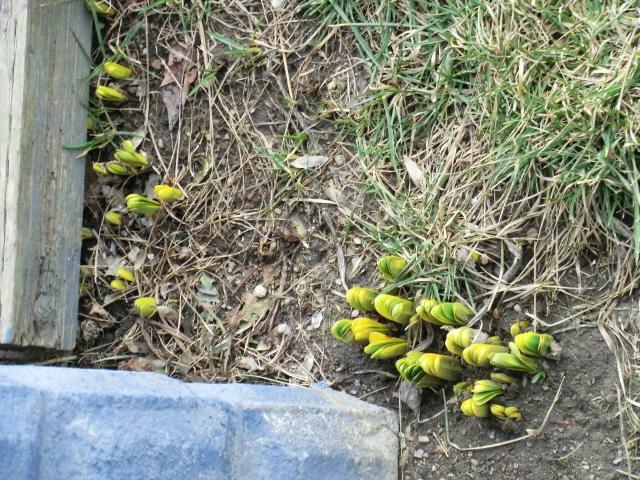 Here’s a picture of the bulbs peeking through the ground at the front of the house. It’s been a colder month than usual with temperatures yo-yoing up and down. I think the plants are confused. 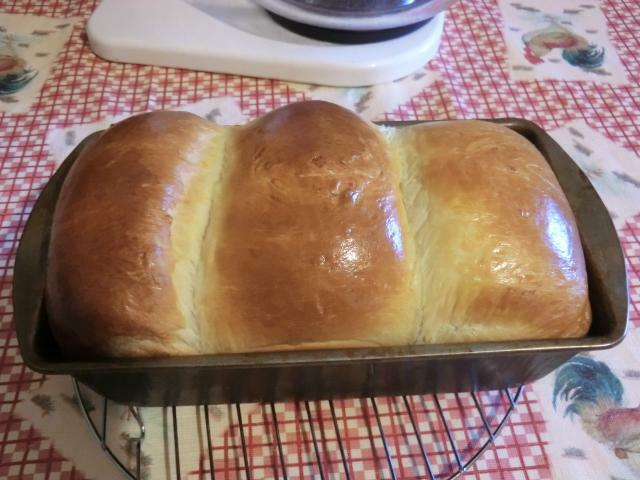 I haven’t made this delicious, fluffy bread in years. And I DO mean, years. This was my first attempt. And then I made it again. It’s easy enough to make … except for the fact that you should really use a stand mixer to knead it for the 10-15 minutes needed to get it to the point where it passes the “windowpane test” and my inexpensive stand mixer travels across the counter, risking falling off, with the effort. 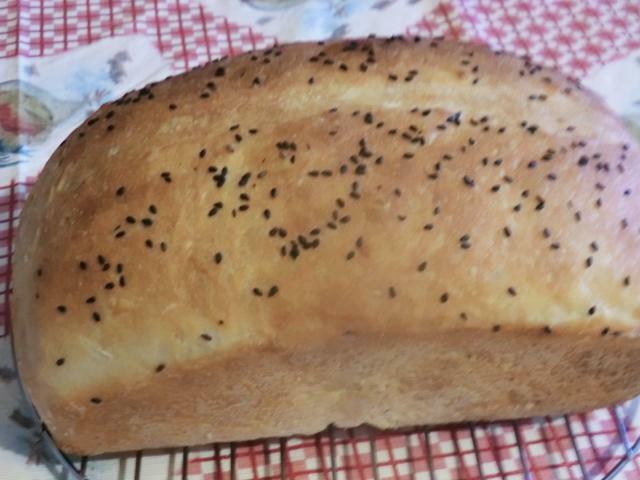 Still, I decided to make it again, because I wanted to ‘sort of’ participate in a bread baking challenge on the Bread Baking FB group. I’ve actually made the recipe they used before, so I decided to try a slightly different recipe. That’s why it’s a ‘sort of’ participation. 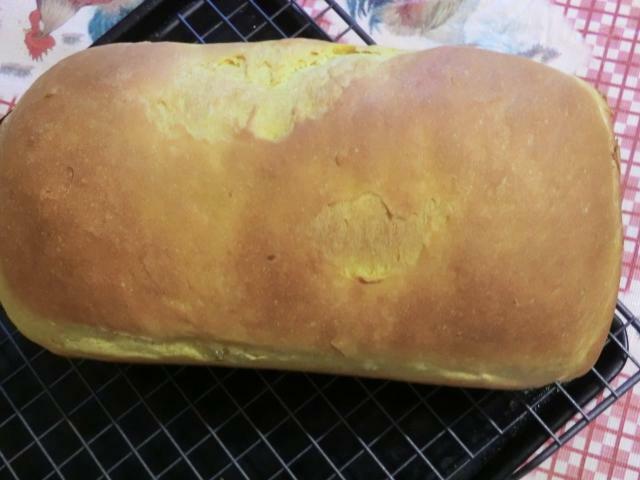 The technique behind this bread is based on making a cooked ‘roux’ of flour and water which is incorporated into the bread dough. This roux is called a ‘tangzhong’. 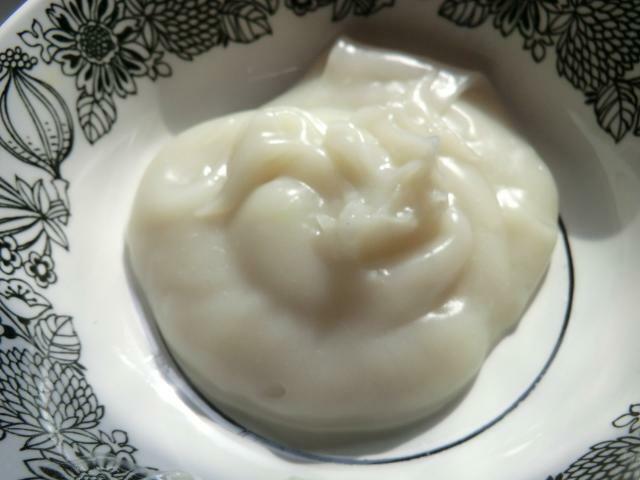 Here’s a picture of the tangzhong … it’s glossy from the cooking process or ‘gelatinization’ of the flour and water. The name refers to the milk or cream and milk powder used in the recipe. And Hokkaido … well, it seems that the milk produced in Hokkaido, the second largest prefecture, or district, in Japan, is something special. Incidentally, the capital of Hokkaido prefecture is Sapporo. Where that famous beer comes from. I like Sapporo beer. A lot. Anyway, this is the recipe I used. I was going to knead by hand, but after about five minutes, I dug out my stand mixer and let it do the job. Tearing the mini-loaves apart gives you an idea of the texture of the bread. 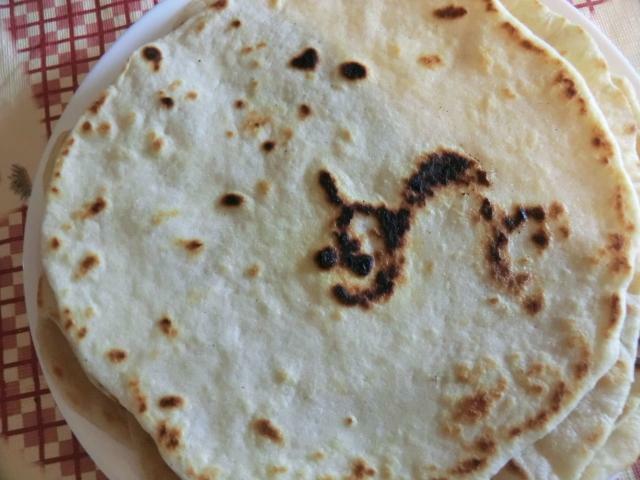 It’s a very tasty bread. Light and fluffy. A bit sweeter than I like, which I knew, but, rather than reducing the sugar, as I was tempted to, I stuck to the recipe. The bread is long gone, by the way. 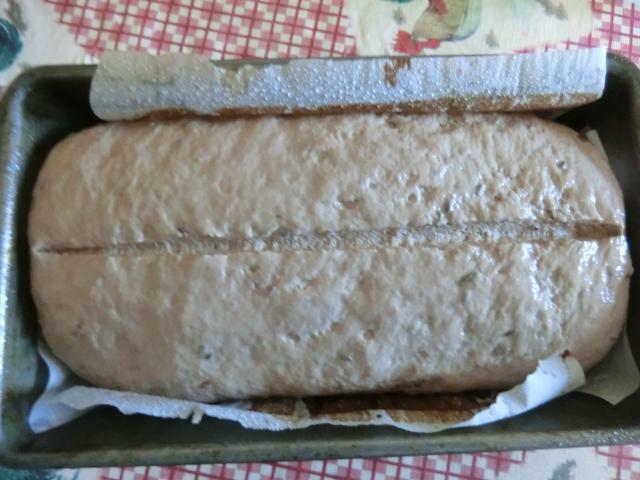 I’m in the process of making the current “bi-weekly challenge” … an artisanal loaf using lager beer. Fortuitously, my brother brought over a 4-pack of Dos Equis Premium today/yesterday when he came to take me out for lunch. The challenge before this was a 2-hour no knead bread. 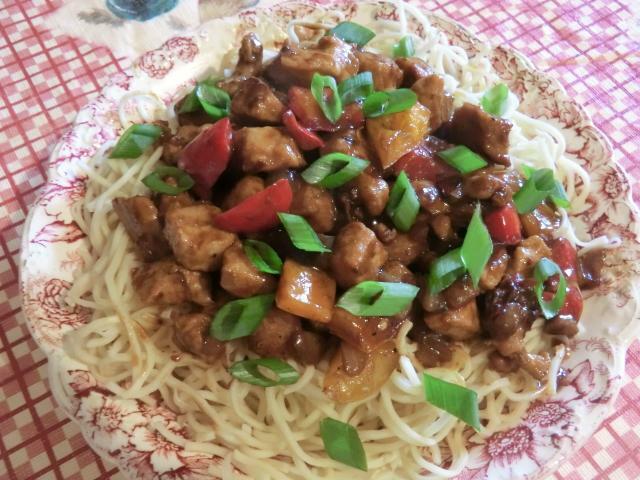 Kung Pao chicken is a classic Szechuan dish, but I had a two pound piece of pork tenderloin in the freezer, that I wanted to use up, so I switched things up a bit. The other elements were still there including the hot chili and crunchy peanuts, even if I forgot to add the latter to the dish, until I was almost finished devouring my first bowl. * I used one chili, with seeds, and it was very bland. 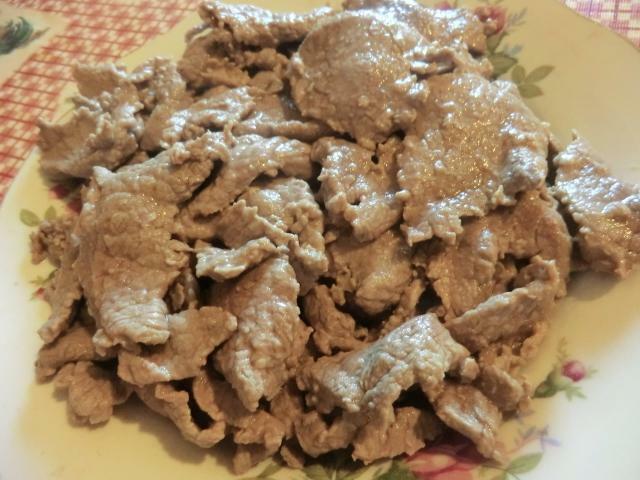 Marinate the pork: In a medium bowl, combine the pork, soy sauce, and cornstarch. Mix well and let the pork marinate, for 1 hour, in the fridge. 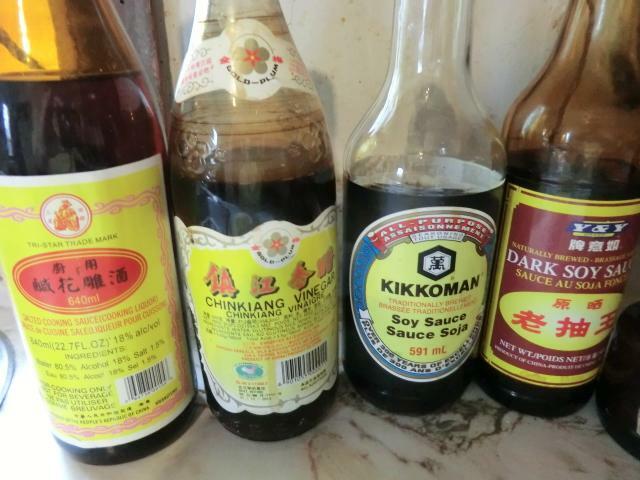 Making the Kung Pao sauce: In a small bowl, combine the light and dark soy sauce, Shaoxing wine, black vinegar, cornstarch, sugar, sesame oil, and water. Stir to mix the ingredients. Set aside. Cooking the pork: Heat up one tbsp of cooking oil in a wok over medium-high heat. Add the marinated pork cubes and flash fry for 3-4 minutes or until the outside is lightly browned. With a perforated spoon transfer the pork cubes to a shallow bowl lined with paper towels to absorb the majority of oil. Retain the remaining oil in the wok as you’ll need it to fry the rest of the ingredients. Cooking the other ingredients: Measure the oil remaining in the wok and if needed, add more oil to equal 1 tbsp. Place the wok back over medium-high heat and add the diced onion, bell peppers, zucchini (if using), ginger and garlic. (NOTE: I don’t have a kitchen fan so I didn’t flash fry the chili pieces and the peppercorns by themselves over high heat before adding the onions etc. Instead, I fried them briefly in the next step.) 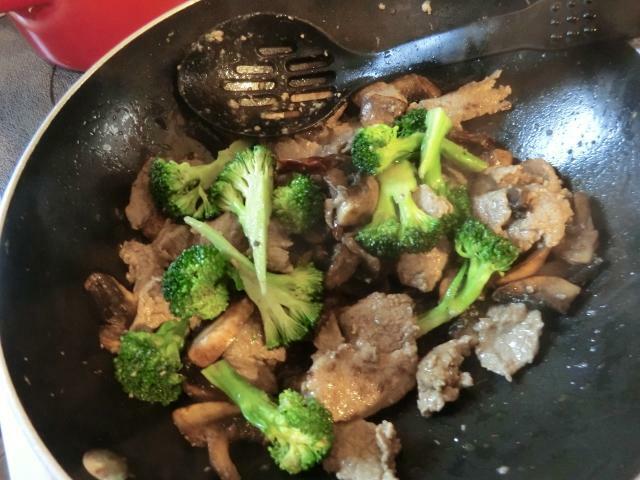 Stir fry for about 5 minutes. The diced onions should be translucent and both they and the zucchini cubes should have browned a bit. Push the vegetables to one side and add the chili pieces and ground Szechuan peppercorns. Fry for a minute or two just to toast the chili and peppercorns. Add the fried pork and continue to cook for another 4-5 minutes. Whisk together the sauce ingredients to redistribute the cornstarch, which will have settled to the bottom, and pour over the meat and vegetables. Stir well to distribute the ingredients and continue to cook until the sauce thickens and starts to bubble a bit. Transfer to a serving plate and serve with the sliced green onions sprinkled over the top as a garnish. 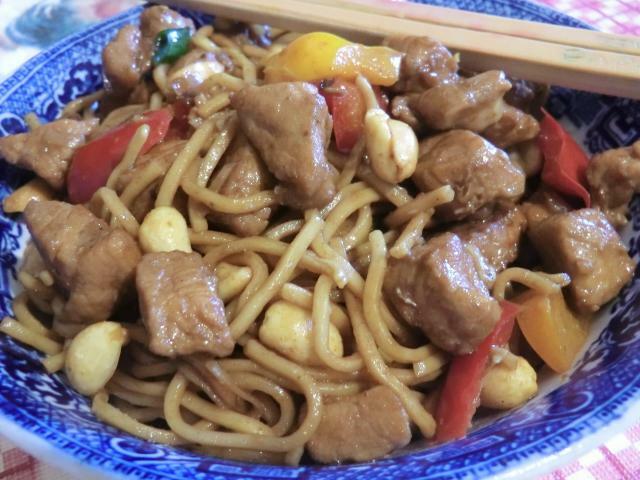 If desired, pour the kung pao over a bed of plain steamed rice or cooked noodles. NOTE: I decided to use lo mein noodles as my starch. 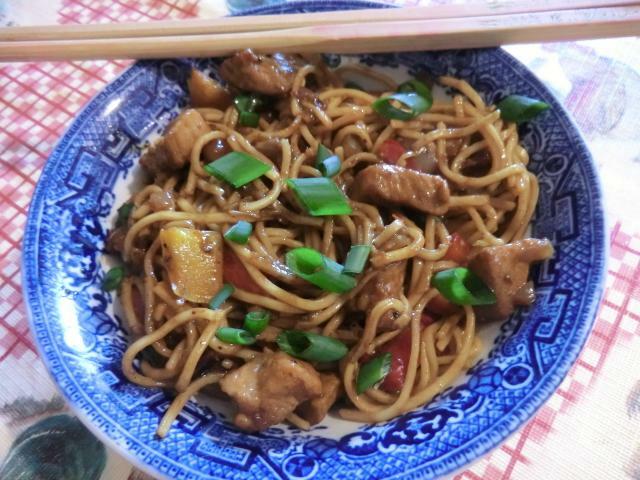 For serving, I tossed the noodles with the pork. It’s a fairly dry preparation.